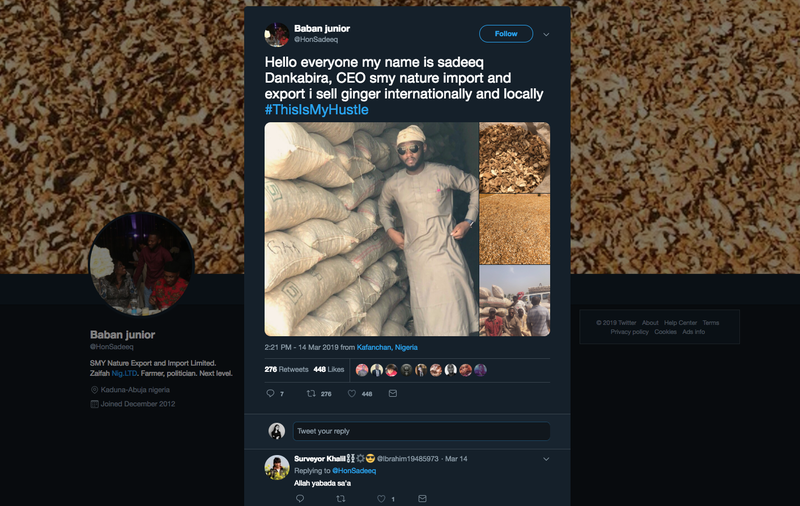 A hashtag called #ThisIsMyHustle started trending in Nigeria in mid-March after Sadiq Abubakar, 30, a small-business owner from Abuja, organized a Twitter chat for his entrepreneur friends. "I said, 'Let's do a hashtag and let the world know what we do,' " he says. "Young Nigerians are very determined to succeed. What we hear about young Nigerian people is that we are lazy. But we are hardworking. We want to make it." He was just expecting a couple of dozen people in his network to tweet — but within an hour, he says, the hashtag went viral in Nigeria, prompting thousands of responses.People started sharing posts that promoted not just their side hustles but also their main gigs, from coding to baking to making art. 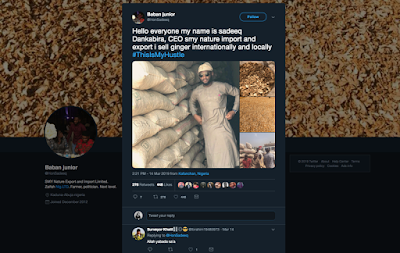 The hashtag has garnered the praise of Bashir Ahmad, the personal assistant of President Muhammadu Buhari, who wrote on Twitter: "Spent over an hour reading every tweet under #ThisIsMyHustle hashtag, every single tweet made me happy genuinely ... I am super proud of you all." Jobs are hard to come by in Nigeria, says Abubakar, so many people have to "hustle" to earn money — starting their own businesses or finding side jobs to supplement their main income. According to Nigeria's National Bureau of Statistics, the unemployment rate in the country was at 23 percent as of the third quarter of 2018. A number of the tweets are about agriculture, which has been hard to sell to youth in sub-Saharan Africa as a viable career. "Young people [in Africa] face particular barriers that often lead to skepticism about farming as a viable future," wrote Kanayo F. Nwanze, former president of the International Fund for Agricultural Development, in 2018. "Youth and other marginalized groups do not see farming as a business, as an economic enterprise." Sadiq Muhammed Kabir, 24, runs his own import-export business selling ginger root in Kaduna. He was proud to share photos of his work on #ThisIsMyHustle. "Most young people in my country don't really see [farming] as something good," he says. "They forget that farming is very, very lucrative." Abubakar says he has received a lot of positive feedback over the last few days from business owners who have been tweeting on the hashtag. "They're telling me that they have been getting more clients," he says. Kabir says that his post has brought in some business too. After he posted his tweet, he says, "my life has never been the same. I got buyers around the world, like Canada, Dubai, even North America." As with many other hashtag campaigns, some people on Twitter had hilarious responses to the tweets.